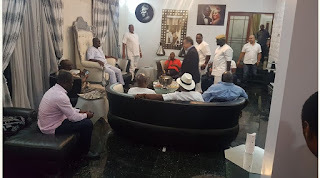 Yesterday, Friday the 13th of October, two former Governors of Delta State, Chief James Ibori, Dr Emmanuel Eweta Uduaghan, were hosted by billionaire business mogul; chief Ayiri Emami, at his exquisite residence in Warri, Delta state. Also present were Hon Solomon Awhinawhi, Chief Thomas Ereyitomi, Rt Hon Victor Ochei, Chief Lemon Ikpea and top Delta political gladiators. It was celebration galore as Mr. Emmanuel Oritsejolomi Uduaghan, is set to be conferred with chieftaincy title by the Olu Of Warri on the 14th of October, 2017.